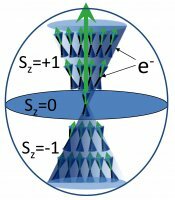 We focus on spin excitations in two or one dimensional electron systems confined in semiconductors (GaAs, CdTe) or magnetic semi-conductors (CdMnTe). 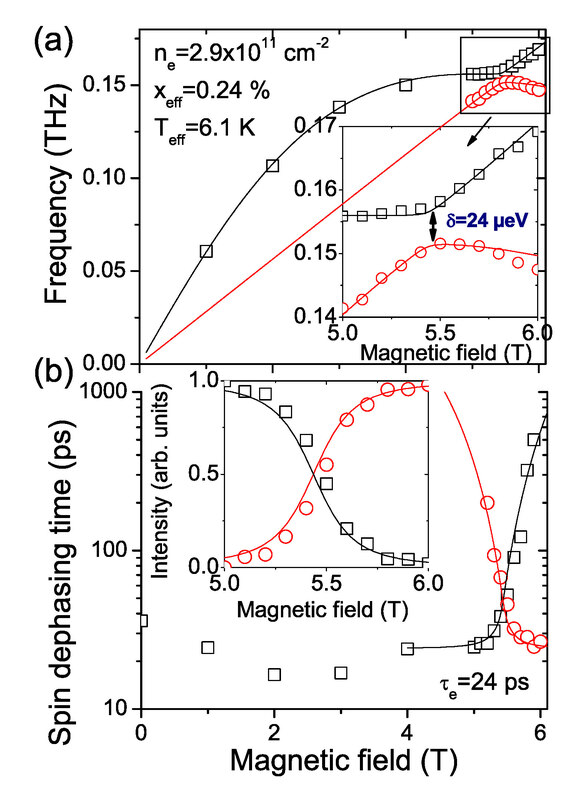 The main technique is resonant electric Raman spectroscopy, however, through collaborations, we investigate time domain measurements of spin excitations by magneto-optic Kerr rotation or time-domain spectroscopy of THz emission. 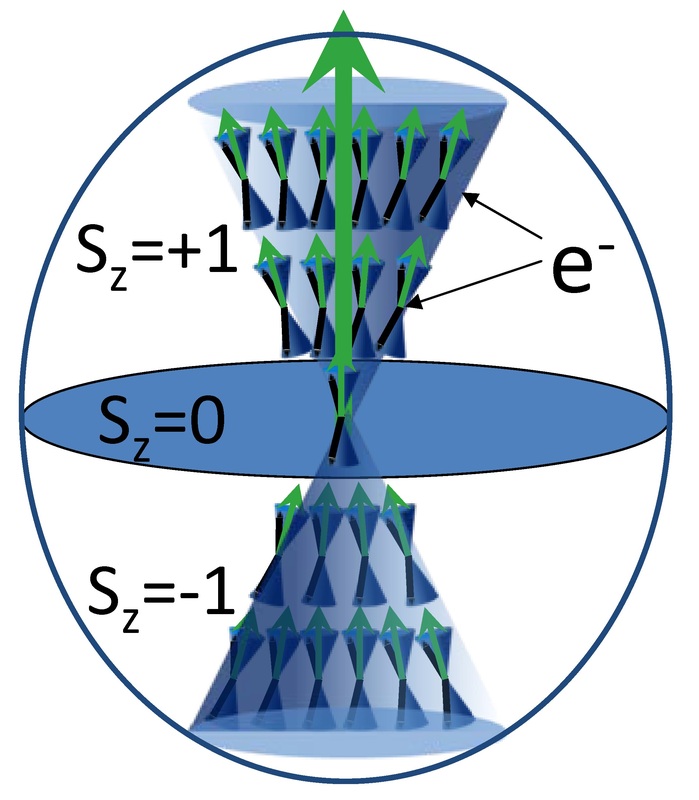 A modulation doped quantum well (the doping layer lies in one of the two barriers only) holds a structural inversion asymmetry (SIA) caused by the electric field of the ionized dopants. Hence, strong Rashba spin-orbit fields do exist. 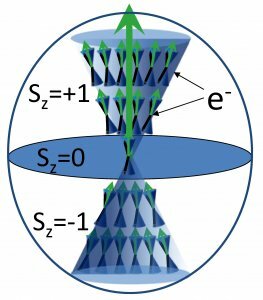 Each individual moving electron experiences an effective magnetic field proportional to its in-plane momentum, which couples to its spin. It results that a collective excitation, formed by the coherent precession of all the electron spins, looses coherence due to the spread of the individual precession frequencies and axis. We showed that a spin wave is immune against this lecherous mechanism. Indeed, because of the Coulomb interaction, the individual spin-orbit magnetic fields organize to construct a single collective magnetic field which governs the precession of the spin-wave as if the collective mode was a single object, a magnetic moment, immersed in a homogenous spin-orbit magnetic field. The phenomenon was observed for spin-modes in a GaAs quantum well  and for spin waves in CdMnTe . The collective field was found to be enhanced by a factor 6 (electron density dependent) compared to the individual spin-orbit field. The collective Rashba constant was 20meV.Å, comparable to the one found in SrTiO3, where Rashba fields are considered as giant. 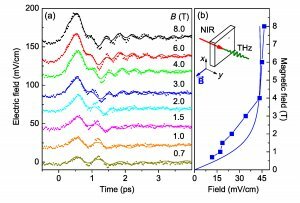 In the search for spin-based THz emitter, we have, with an optical femto-second pulse, excited the spin-wave modes of a 2DES embedded in a CdMnTe quantum well. The coherent spin precession starts and radiate an electromagnetic field which was collected by electro-optic sampling, thanks to the tunability in the THz range of the spin precession frequency. The latter is allowed through the adjustable Mn concentration. We demonstrated the spin origin of the observed radiation. 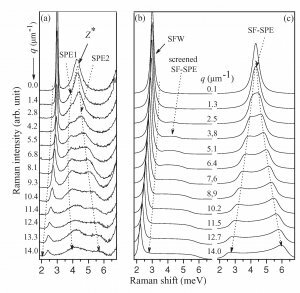 We introduced a model system to study the spin excitations (spin waves) of a conducting two dimensional electron system (2DES). The 2DES is embedded in a Cd1-xMnxTe quantum well. 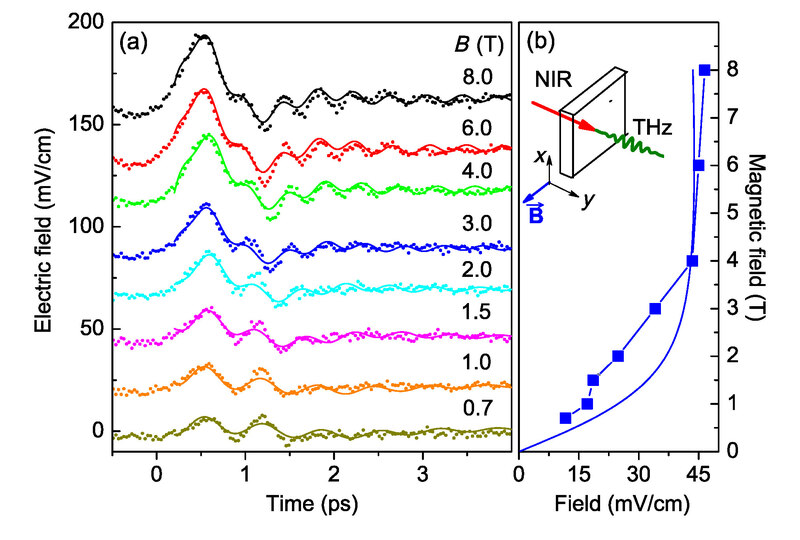 Insertion of 1% magnetic impurities of Mn creates a local exchange field which can be adjusted by the Mn spin-polarization and the Mn concentration x. 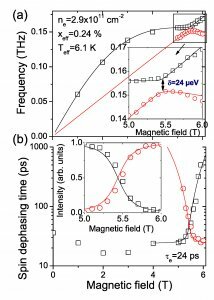 Such a 2DES is strongly spin polarized at low magnetic fields, with negligible orbital Landau quantification. Thus, it mimics the spin physics of ferromagnetic diluted magnetic systems while having the advantage of high carrier mobility (µ 105 cm2/Vs). Given that, we have measured the dispersion of spin waves [1,2], showed that the carrier kinetic causes an intrinsic damping of spin waves and me have modelled the responses of this spin polarized 2DES  together with its excitations . 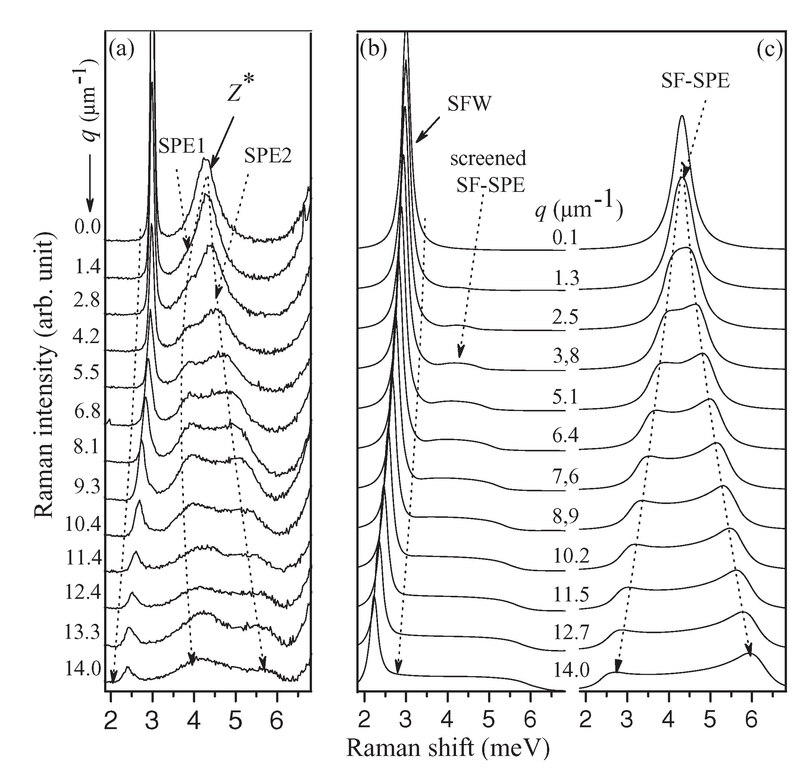 A spin enhancement of the spin susceptibility has been evidenced [6-8]. These studies, important for the understanding of spin-resolved Coulomb interactions, have been summarized in a book chapter. In the frame of an ANR project, aimed at using the previous spin waves to transmit a logical spin-based information, we studied the spin wave dynamics with pump-probe magneto-optical Kerr techniques. Two techniques were used : one pump beam to excite zone centre modes only and two crossed-polarized pump beams to excite spin waves propagating in the quantum well plane. The spin modes of a semi-magnetic systems are composed of two branches where electronic spins and Mn spins oscillate in phase (acoustic spin modes) or out of phase (optical spin modes). These two modes anticross at a particular magnetic field, where an exchange of the dynamics and the character occurs. The anticrossing gap reveals the strength of the dynamical interactions between the two coupled spin systems .